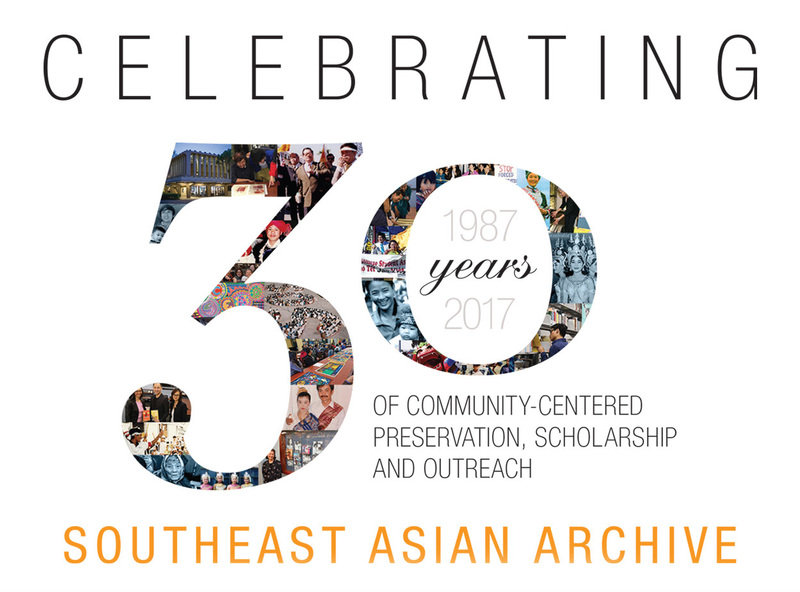 The impetus for the Southeast Asian Archive came from the Southeast Asian-American community itself, in the mid-1980s. Members of the local Southeast Asian-American community proposed that their histories be preserved at UCI. In response to overwhelming community support, the Southeast Asian Archive was founded in 1987 by the UCI Libraries. Today, the Southeast Asian Archive is celebrated and recognized internationally as a model “community-based archive” both within the archival profession and in the scholarly community at large. Its significance has been recognized by the media and in multiple prestigious grant awards. The OC&SEAA’s strategic priorities include public programming, providing oral history training to internal and external groups and building community archiving skills. Equally, the center provides a flexible teaching and research space for UCI students and faculty, visiting scholars and community members of all ages. Investing in the SEAA and OC&SEAA Center ensures future generations have access to materials, resources, space and experts to help ground who they are and what talents they will share with our community. The Orange County and Southeast Asian Archive (OC&SEAA) Center helps to document and preserve our regional history for future generations, and has become a popular venue for bringing together campus and community members. The 2,200 square feet of space provides flexible research/study areas, a reconfigurable space for programs and instruction and an oral history studio. This space also includes the circulating collections for the Southeast Asian Archive and Orange County Regional History. Funds to name the Center could support staffing, acquisitions, teaching and service/outreach activities to the campus and community. Funds from a named lecture series will provide ongoing support to bring renowned scholars focused on Orange County, diasporic communities in Southern California or the Southeast Asian-American experience to the Libraries--enhancing the visibility of our collections and creating meaningful engagement with the communities we serve. A named film series fund will provide ongoing support for the Libraries to host film screenings and focused group discussions in the OC & SEAA Center. Through the film series, we aim to raise awareness of diversity issues on campus and beyond—using film as a platform for dialogue, education and productive inquiry and action. This named endowment fund will support student interns working with the Orange County Regional History collections or the Southeast Asian Archive. Offered only in the summer, this unique internship will provide students with the opportunity to explore world-renowned library collections, create and edit original descriptive information for manuscripts and archival collections using specialized software, learn basic rare materials handling and preservation procedures, and attend job talks by professional librarians and archivists. A named library collection fund provides a lasting source of income that enables us to purchase (or acquire access to) essential books, journals and other educational materials in all formats (print, online, multimedia, etc.) that support the teaching and research on campus, as well as enhance the Libraries' role as a major information resource for the community. To ensure that our collections are preserved and made available for use, gifts to support our collections will help to process, digitize and/or preserve a single collection. Wendi Morner, UCI Libraries Director of Development, will be pleased to answer any questions you have. You can reach her at 949-824-8904 or at wmorner@uci.edu. Thank you for your consideration. We look forward to partnering with you!